2016 was supposed to be Justin Davis’ season to be, but a high ankle sprain and being supplanted in the lineup caused his numbers to suffer. 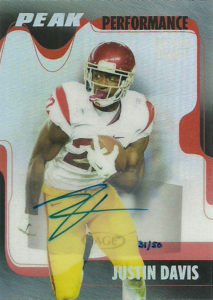 The nimble runningback ended up with 564 yards and 2 TDs in his last year at USC. He was not selected in the 2017 NFL Draft. Undaunted, Justin signed with the Rams as a free agent. I guess it made sense with the locality of the franchise to USC. The Rams were loaded at runningback. With Todd Gurley firmly entrenched as the starter and Lance Dunbar behind him, Davis had to unseat either Malcolm Brown or Aaron Green to stand a chance of making the roster. Davis had an inspired preseason. With most of the RB corps either resting or injured, Justin came out and after dropping the rock twice in three carries, he put together a pretty solid argument for making the Rams roster. He beat out Green, and actually made the final cut- thanks in part also by the suspension of Dunbar.